Animal sentience is simply the capacity of an animal to feel. If you’ve spent time around animals, you’ll know they can experience feelings and emotions - it's common sense. But it’s also supported by decades of scientific research and evidence and is already recognised internationally and Victoria is planning to recognise it. The Boards of various animal welfare and rehoming groups across the NT have jointly written to the Chief Minister, Minister for Primary Industries and Resources and Opposition Leader calling for this recognition. This includes: RSPCA Darwin, Paws Darwin, Top End Rehoming Group, Nhulunbuy Paws, Katherine Animal Information Service and Alice Springs Animal Shelter. Recognising the sentience of animals in the Objects of the Act will better inform the community, administrators and judges on why animal welfare matters. This is not only symbolic but also serves to aid decision-makers in the application and interpretation of the legislation. We now need the support of the NT community to tell our political leaders to lead in this matter, rather than follow. 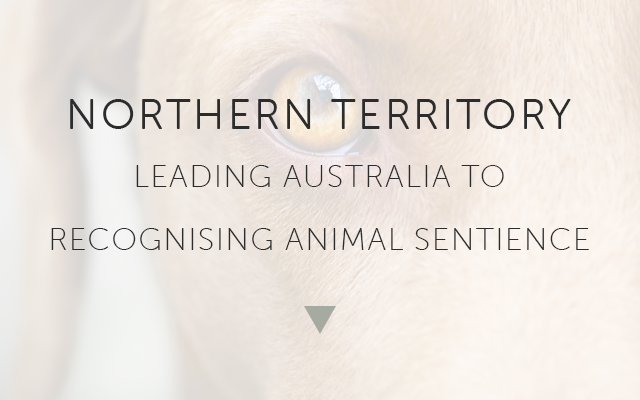 Let our political leaders know the recognition of animal sentience is what you expect for good animal welfare in the Northern Territory.